With the recent downturn of the Florida Gators football program, all eyes in the Sunshine State have turned to the ACC in hopes of a seeing a hot rivalry that keeps one of the nation’s premier recruiting grounds relevant in the College Football Playoff conversation. Defending National Champion Florida State helps to give the conference relevance, and even though their air of invincibility has been weakened this season, they’re still on a course for one of the bracket’s top two seeds. But they’ll need to win the state to win the conference, and their old rivals are waiting with a fully-loaded rushing attack. The vaunted Seminoles defense will have to answer the call once again to maintain their ranking. That rushing attack’s waiting in south Florida, and its name is Hurricane Duke. Junior running back Duke Johnson is at the center of the Miami Hurricanes‘ hopes to play a substantial spoiler for the Seminoles’ hopes to repeat as champ. A hometown product with unlimited potential, Johnson is finally enjoying a season of good health that allows him to showcase his toughness, slick moves, and top-flight speed. The worst part of the storm coming to Sun Life Stadium this weekend will be the matchup problems posed by the Florida State offense for the Hurricanes’ inconsistent D; it’ll be on Johnson’s shoulders to keep Miami in control of the clock and Heisman winner Jameis Winston off the field. South Beach likes its star-power, and this game’s finally got it back on both sides of the ball. 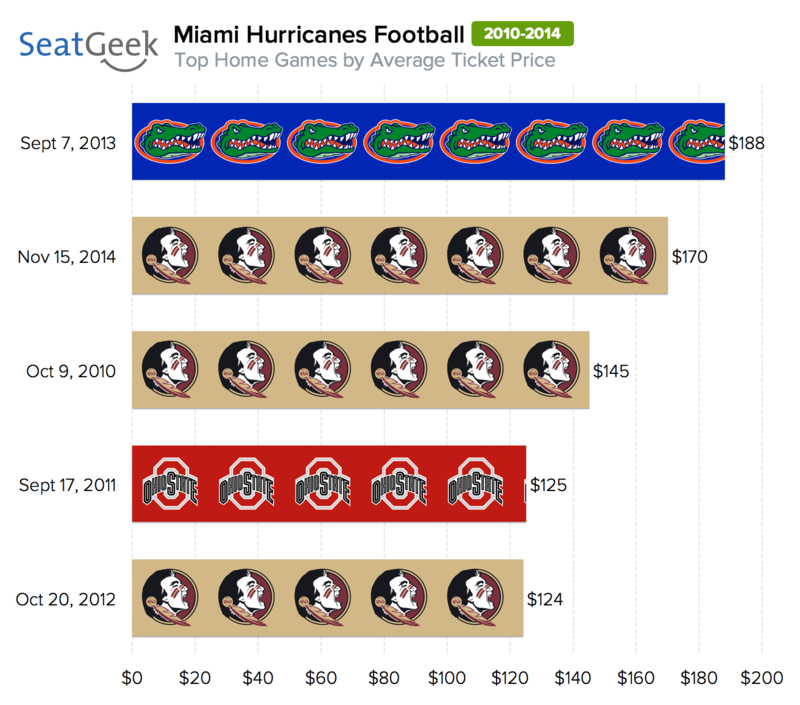 Fans have so far paid an average of $170 for a ticket to the Florida State game this weekend, making it the most in-demand FSU at Miami game since at least 2010 when we began monitoring secondary market prices. It’s also the second-most expensive ticket for a Miami home game in that period behind only last season’s game against the Florida Gators ($188 average ticket price). FSU at Miami is also the third-most expensive ticket of the weekend in college football and the most expensive outside of the SEC. Only Auburn at Georgia ($275) and Mississippi State at Alabama ($187) are pricier, with all three games carry significant College Football Playoff implications. Tickets for Saturday’s game are reselling for more than eight times the cost of any other Hurricanes home game this season. The Duke game earlier this season was the next-most in-demand game of the year, but seats for that matchup resold for just $21 each. The Florida State game has traditionally been one of the biggest games of the year for Miami, as three of the five most expensive Hurricanes home games since 2010 have come against the Seminoles. The 2010 matchup drew an average price of $145 per ticket (both teams were ranked in the top 25 at the time), and tickets for the 2012 game between the two schools resold for $124 each on average. As of noon Monday, the cheapest seats available on the secondary market for FSU at Miami are listed at $105 each in Section 432 of the upper deck, just $14 below the cost of a season ticket package in that section! A front-row seat in Section 142 at midfield behind the Miami bench, however, will set you back $431.